An exciting find at Moorabool is this portrait silhouette of Sir John Franklin. His name is very familiar in Tasmania; as stated on the back of this newly discovered portrait, he was Governor there 1837-43, and his name appears across the state with a town on the Huon River, and a major river which narrowly avoided being dammed, an electorate, plus his splendid statue in the middle of a fountain in Hobart. 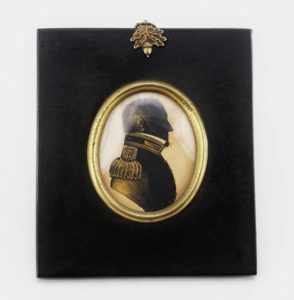 This silhouette is a majorly important piece, being a very personal depiction for which he would have had to sit; a frontal painted portrait could be mocked up from a printed image, and often was of famous people (for example Napoleon). However, a profile must be drawn from life, and this portrait has a secret beneath the image in the form of an original ‘trade card’ for the artist; in this case, George Atkinson, ‘Profilist to His Majesty’ (George III) at no. 40 Old Steine, Brighton. What is exciting about finding the trade card is it allows us to date the piece to 1822 -1828, the years he operated out of that address. During this time, Sir John must have visited and sat for his profile to be taken. Not for long – George Atkinson prided himself in his speed, advertising a sitting took ‘less than one minute’. One can imagine Sir John dropping in, dressed in his Navy uniform, before striding out a minute later to take the airs on the promenade at Brighton! These portraits were the equivalent of a studio photograph today. Atkinson charged 10s 6d for a detailed profile, a not so insignificant amount. So who did he have a portrait done for – to whom was this portrait gifted? A look at his activities 1822-28 provide the most likely answer. He was quite an active Navy officer, spending some time exploring the Arctic reaches above Canada, but still found time to marry in 1823 to a Romantic poet named Eleanor Porden. They had a child in 1824; she died in 1825. He was off on another Arctic expedition shortly after, returning to England in 1827. Was it at this time he visited Brighton, for a little R&R? Perhaps having a portrait done to give to a special friend of his late wife, Jane Griffin…. and perhaps it worked, as they were soon married, in November 1828. She was the fascinating strong-willed ‘Lady Franklin’, who came to Tasmania in 1836 and is considered by some to have been the driving force behind Franklin’s time as Governor. This portrait came from a local Victorian source, and perhaps came to Australia with The Franklins in 1836, only to be left behind in 1843 when they returned to England. Internationally, Franklin has recently been of increasing interest due to his exploits after he left his position in Tasmania. This interest stems from the tragedy of his final adventure, his quest for a North-West passage through the Arctic ice above the American continent, a short-cut to the Pacific ocean that would have had great consequences for trade – if it had existed at the time. Ironically, with ‘global warming’ ships have recently been able to pioneer this northern route between the oceans – but when Sir John attempted it in 1845, he found no way forward. No way back either… surrounded by thick sea ice, he and his two ships on the expedition, Erebus and Terror were stuck. They were well equipped for such an incident, but a decision was made to try and walk out; all men and their commander disappeared in the Arctic wilderness, along with the ships. They had three years worth of provisions, but once that time was up the British Admiralty offered a £20,000 reward for resolution. Expeditions were mounted, but only a few graves and cryptic clues were found; Sir John Franklin and his 128 men had perished. The recent interest came as a result of the excited announcement from Parks Canada in 2014 – they had discovered the wreck of Erebus. Two years later, their search revealed the Terror. Both are in relatively shallow and accessible waters, and dives on them have been nothing short of sensational; the state of preservation in the low temperatures is superb. 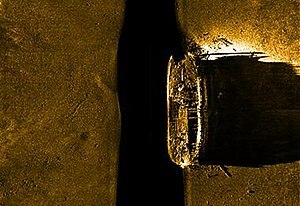 HMS Erebus, on the seabed 2014 in this side-sonar image from the moment of discovery. An announcement in April 2018 by the British Government has resulted in the British ‘gifting’ the remains to Canada; an exciting future awaits as plans are proposed to recover items from these incredibly important ships – indeed, perhaps even the ships themselves! 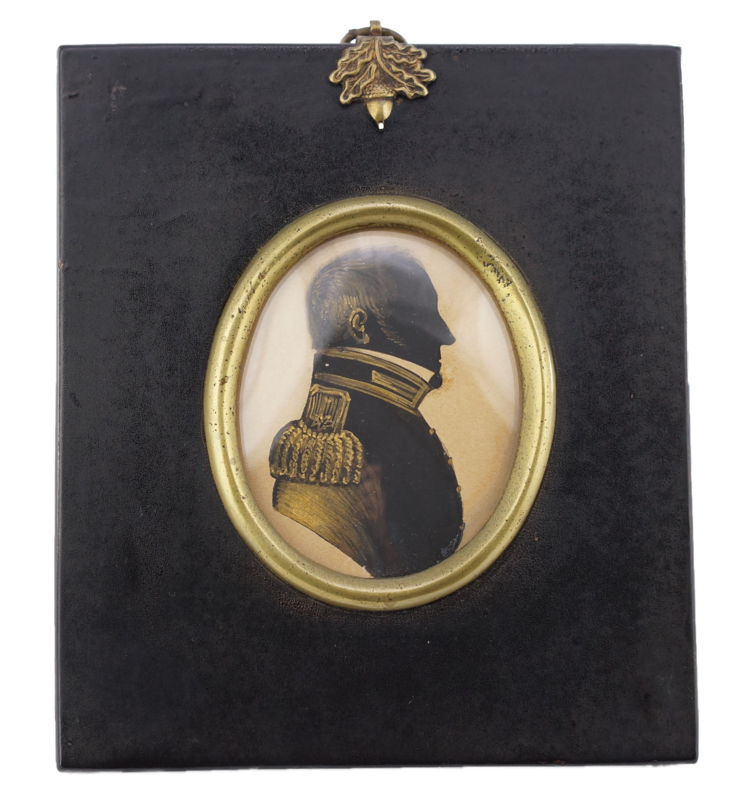 We are thrilled to have discovered this previously unknown silhouette portrait of Rear-Admiral Sir John Franklin.